Silent sentinels of the Namib Desert, the giant dunes of Sossusvlei look out over a rolling ocean of sand. As the sun rises they change colour from purple to peach to orange – surreal backdrops to skeletal trees and bone-white saltpans. It’s a photographic feast, and if you look closely enough, animals appear – antelope, beetles, birds and lizards. 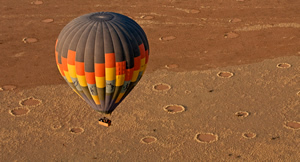 A Sossusvlei safari is the centrepiece of most Namibia tour itineraries, whether fly-in or overland. 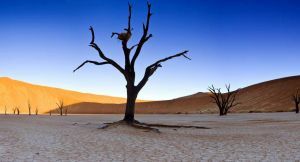 The region receives barely any rain all year, the malaria risk is negligible and the experience combines easily with Namibia’s other must-see destinations such as Etosha and Damaraland. 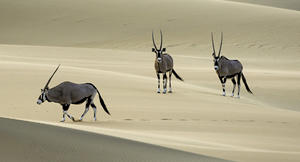 And thanks to Namibia’s infrastructure, Sossusvlei can be included on a self-drive adventure. There is no accommodation at the mighty dunes themselves but the area is home to lodges ranging from honeymoon hideaways to private family villas. Several welcome self-drivers. Some lodges are within an hour’s drive of Sossusvlei; others are set further away on private reserves. 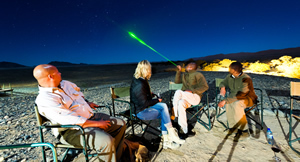 Besides tours of the dunes, guests enjoy activities ranging from game viewing and quad biking to hot-air balloon flights and hiking; at night you’ll sit down to star-gazing & fine food. 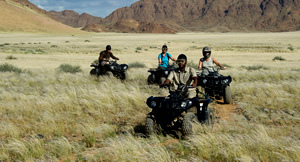 Browse our accommodation recommendations and list of packages that include Sossusvlei. We offer a range of tours that appeal to many traveller types – honeymoon, family, budget and exclusive-living – as well as self-drive tours with everything organised for you. 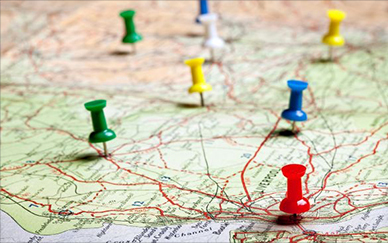 And if you can’t find what you’re looking for, simply contact us for a tailor-made itinerary. If you are planning a self-drive safari, please note that although a 2-wheel drive vehicle will be fine for most of the road to Sossusvlei, a 4X4 is needed to go all the way. For travellers not on a tour and without 4-wheel drive, a 4X4 shuttle is available for the final few kilometres. Sossusvlei’s dramatic dunes are best seen at dawn; their sweeping shapes & shifting colours make for fantastic photography. 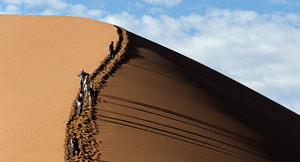 Kick off your shoes at Dune 45 & walk to the top for sunrise over the Namib. Whether it’s by light aircraft or hot-air balloon, a flight over Sossusvlei is the best way to grasp the scale of this ocean of red sand. Dawn balloon safaris end with a champagne breakfast! 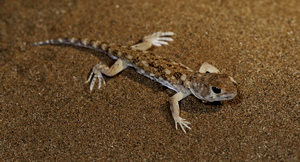 Expert guides reveal what lies just out of sight; jackals in the shade, hidden birds & secretive reptiles plus bizarre plants. Several lodges lie on private reserves, adding antelope, zebra, hyena & ostrich to the list. The night skies above the Namib deliver world-class stargazing. There’s no light pollution, barely a sound & the stars stretch between the horizons. Some lodges have telescopes & ‘star guides’ to steer you through the cosmos. Lodges on private reserves offer opportunities to lace up your hiking boots or settle back & let horse power do the rest: with reins & saddle or from behind the handlebars of a quad bike. World-famous Sossusvlei is the name of an enormous clay pan, flanked by the famous sand dunes that flush red in the early morning sun. Dead Vlei, another pan where water once flowed, but now all that remains are the skeletons of trees reach up out of the cracked earth. 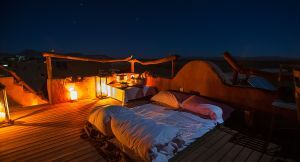 Sleep out under the starry starry skies of the Namib and be lulled to sleep by the sounds of Africa on the roof or your unit. The Namib is known for its clear night skies, and with no light pollution it is the ideal spot to enjoy the stars and planets. After dark, another realm of the Namib Desert awakes. 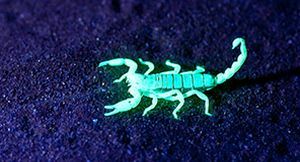 Night walks around the lodges reveal some of these captivating critters such as dancing white lady spiders and scorpions which fluoresce under UV lights.